So now that we’re taking care of three wonderful goats, the most immediate question is how much should we feed them? Their previous home didn’t include much pasture for them to graze one and the owners told us they fed them about a cup of grain and one section of hay each day. I was initially surprised, because it didn’t seem like a lot of food for three dwarf goats, but after doing some research, I found out their’s not much consensus on what and how much to feed goats. What I came away with is that they shouldn’t receive much grain (which is why they’re only given a cup among the three of them). It seems like grain is more of a junk food for them, so I’ve currently cut down how much grain they get, since they have so much pasture to graze on, and I’ll go back to giving them one cup in the winter, when they’ll have less weeds to eat. From my google research it seems hay is a bit more controversial. Some sites said if they’re grazing, they only need hay if you’re milking them, but others said they give them as much hay as they want to eat. Right now it’s fall and they while they don’t have as much of a variety to graze on, I have been using the cooler temps to do some weeding. That’s right, they’ve been getting about four of these a week. And they seem to love it! Still, since winter is fast approaching, I’m going to continue feeding them the same amount of hay and see how they do in the spring. 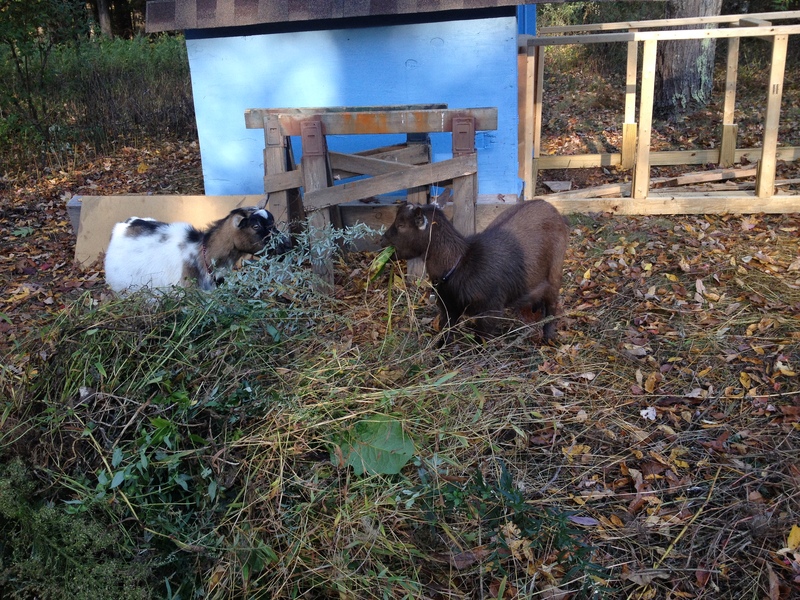 < Previous Meet Our New Goats, Ellie, Romulus, and Remus! I’ve never had goats on our little farm, but I must say I keep tossing around the idea. I just don’t know enough about them to take the plunge. I have an 80 x 80 area with a small shelter on it, problem is it was built for horses. Than means the fence isn’t suitable to contain goats. I can’t figure out how to lay wire over the coral panels where it will be secure enough to keep goats from escaping! I once had to make a trip to Home Depot to buy a single fence post because one of our goats kept jumping over the fence. While at home depot, I met a woman who was there for almost the exact same reason, except in her case her horse kept jumping the fence at one spot. We thus found out that both species were opportunistic escape artists! Yep, this is why I need to get ‘goat ready’ before I find myself in a jam. I’m in the city on one of the few farms that still exists. Sure don’t need escaping goats drawing attention to my place. We used a hard wire cloth to reinforce an existing fence that we had and kept it together with plastic zip ties. Our fence is about 3 or 4 feet high, and they haven’t tried to jump over it, but I noticed it doesn’t take much of a gap for them to be able to squirrel their way under the fencing. In terms of food quantities, we’ve found that our goats are more stressed in the winter than in the summer (we’ve lost 3 goats in the winter, none in the summer), so we have typically provided them with plenty of hay one it gets cold and there is no longer pasture. You can probably tell just by observation is they are losing weight and need more food. Of course with all the weeds you are feeding them right now, they are in goat heaven! 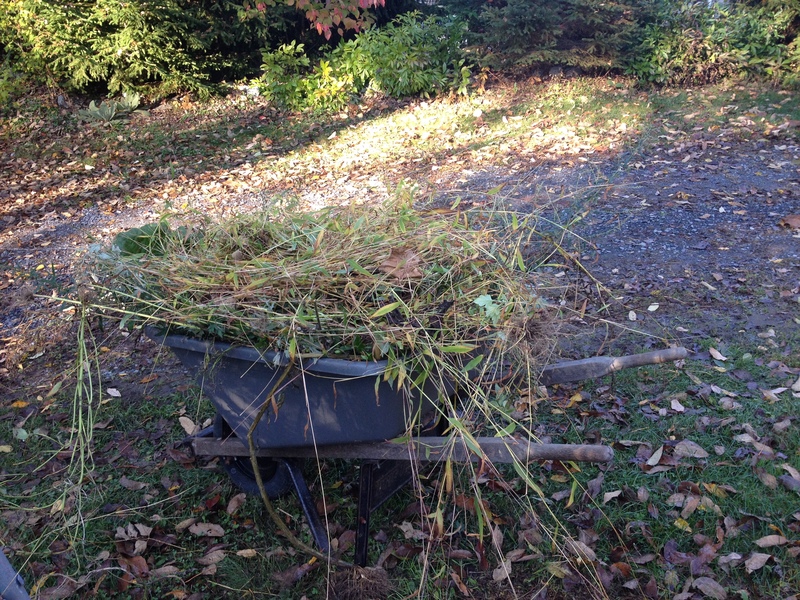 Actually most of the weeds are gone already, and they don’t seem too interested in what’s left. I could tell they were hungry since they made their first escape attempt! So we decided to increase their hay start giving them grain again. Sounds good. If they have started to escape, or at least to try, it sounds like your investment in individual collar bells was spot on!